Welcome to D J Roofing & Construction! At D J Roofing & Construction, we believe that owning and maintaining a home is something special. For many, it is the American Dream. It stands to reason that once you own that home, you want to have the best craftsmanship and products possible. The protection of your family and your investment is important to us. Gambling on an inexperienced contractor to repair or rebuild your home can be devastating, and that’s not a risk you want to take. Our company appreciates the opportunity to assist you with your home repairs and renovations. We pledge to provide you with honest and fair estimates. 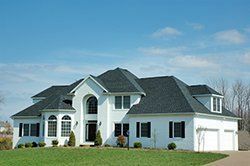 Our estimates include the finest-quality products ranging from GAF roofing products, Simonton Windows, NT Windows, and James Hardiplank Siding available to our customers. We have been proudly serving the North Houston, Spring, The Woodlands, Conroe, Cypress, and Kingwood communities for over 36 years and look forward to a bright future! Our customer service is our top priority, and we strive to introduce new and proven solutions for all home repairs and renovation issues that are presented. Our staff offers friendly, courteous, and honest advice to help homeowners whenever needed. Our company has a long history involving roofing and construction. Beginning in 1949 in Houston, Texas, founder Dennis Sessions’ father embarked on a lasting career working with the roofing and construction industry. Under his father’s mentorship, Dennis learned to perform quality workmanship, to value honesty and integrity, and to respect each customer. Determined to continue this tradition, Dennis Sessions established D J Roofing and Construction in 1979. Today, our company has been proudly serving the North Houston and surrounding communities for over 36 years. We pledge to continue to offer a fair and honest approach to assist our customers with home exterior and interior repairs and renovations. Our pledge is to continue to provide our customers with the professionalism and courtesy they’ve come to expect. We appreciate their confidence! Concerning your roofing, siding, home exterior repairs, skylights, energy efficient windows, patios and home exterior makeovers, consider contacting us today.